I did the Thakhek motorbike loop with two German girls. It is amazing to do. We did it in thee days and saw some incredible stuff. From views to waterfalls and from caves to villages. When you have the time do the motorbike loop in Thakhek. We started the motorbike loop in Thakhek. you can also start somewhere else on the route but Thakhek is a easy place to go and you can rent cheap motorbikes in the center of Thakhek. In every motorbikeshop you can get a map of the route. As well in the travelers lodge guesthouse. You can decide to do it in three days or in more. Its passible in three but it is hard to see everything. Four days will be better to see everything. When you have the map you can decide which direction you want to do the loop. We did it started to the right. If I have to give an advise look at the weather forecast. In total you’ll ride ca 450km in between the mountains so the weather can be different. On the map you’ll find the caves, waterfalls and all other touristie stuff. 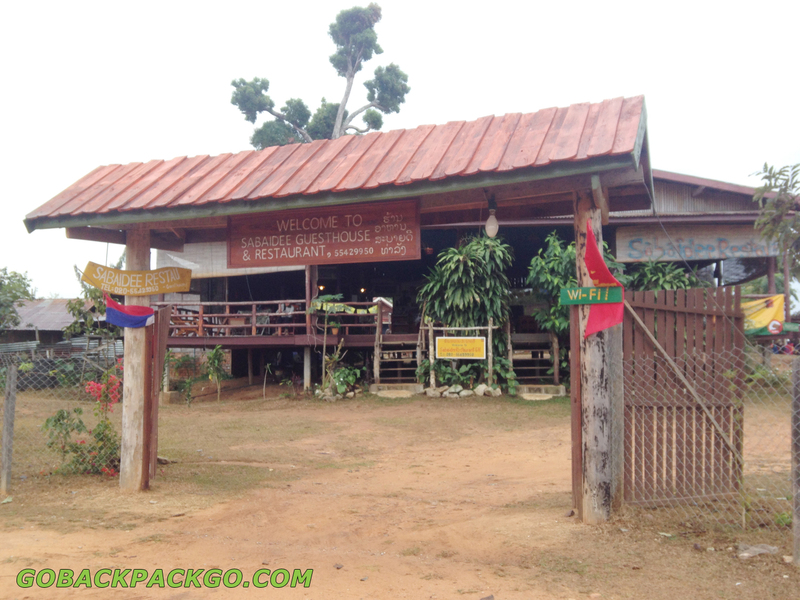 The travelers lodge provides also a logbook where you can find the latest news about the Thakhek motorbike loop. Written by people they did the route a few days before. 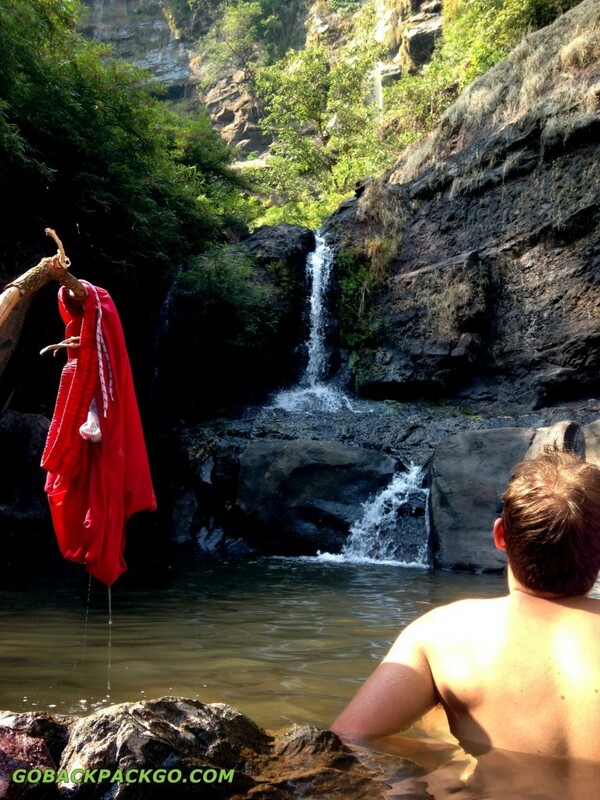 Most of the time this is good information because the waterfall can be dry or certain things. Don’t forget to talk to people in the guesthouse where you stay, most of the time there are people who did the loop before you. We used the offline map Maps.me to navigate and measure the distances. My tip: don’t skip the Konglor cave! 7 km in the Konglor cave by a boat. I realy liked this trip. Note: after Tha Lang 16 km of the road isn’t asphalted yet but you can drive there with your motorbike to do the entire loop. We rented a motorbike in the center of the village at Wang Wang. This is way cheaper than at the lodge. So for three days we paid around 40.000 person (40 euro or $50) for the entire 3 day motorbike loop Thakhek excluding food. We stayed the first night at Sabeidee guesthouse in Tha Lang. It is a nice first ride to there and the BBQ is amazing! Great food for 50.000. Sounds expensive when you compare it but don’t compare it. It is good! The beds are simple but good. And last but not least a nice hot shower. The price for a simple private bungalow was 40.000 ($5) for two persons and the dormitory was 25.000 ($3) a person. 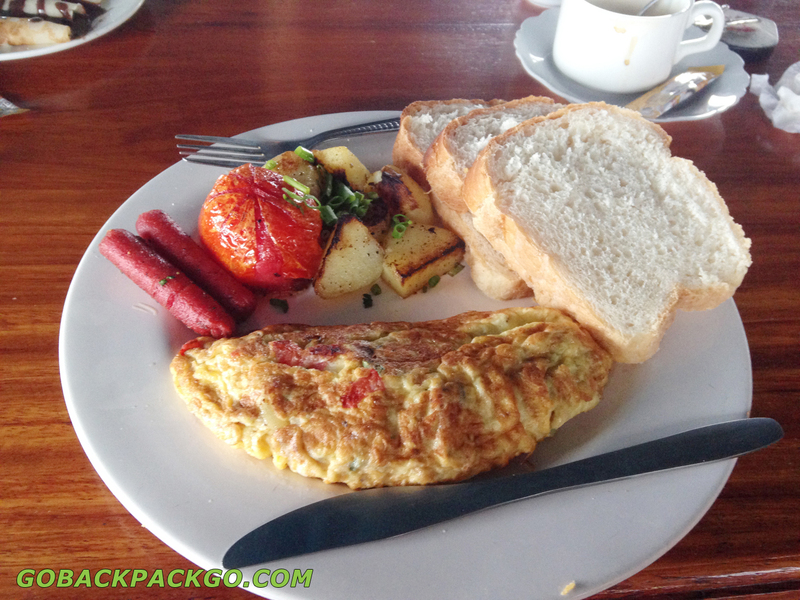 In the morning I ordered breakfast (30.000 or $3.8), the omelette was really good. Second night we stayed next to the Konglor cave in Konglor the village. 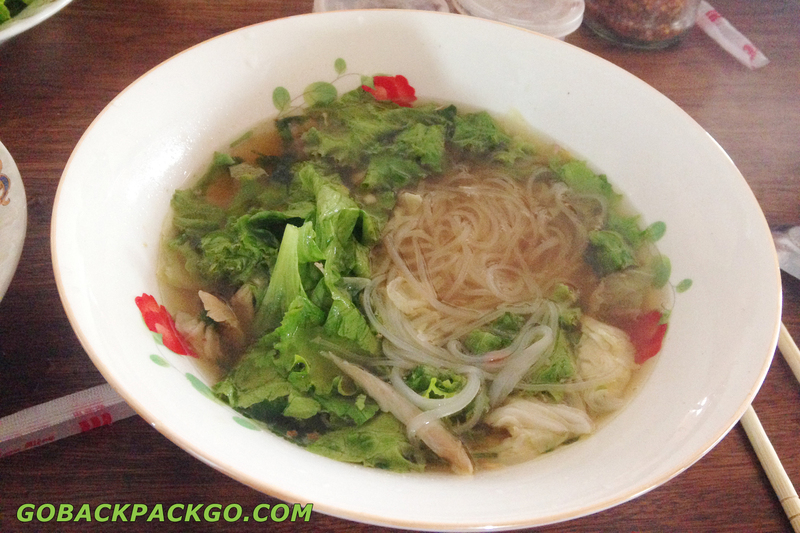 You can do a homestay over there or go to one of the guesthouses. We stayed at the Enjoy boy guesthouse. At the opposite site of the street there is a nice restaurant with nice prices and view on the river. 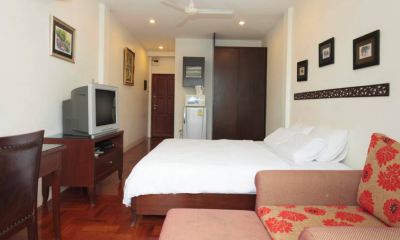 The room at Enjoy boy was 60.000 ($7.5) for two persons. Last day we had lot of rain just before the Khoun kong leng lake, we wanted to go there for a swim (nice blue water). So we went back to the travelers lodge in Thakhek. If you want to make sure you’ve a room you can book it in advance. Sometimes you’ll arrive in the evening and it is nice to have a shower and good bed after the rides. I hope you’ve also a nice motorbike loop near Thakhek! Do you like motorbike loops, check also the Pakse motorbikeloop. 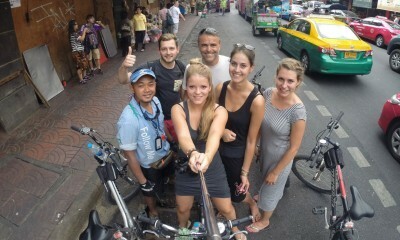 Cycling in Bangkok with biketour! I just did this loop and it was so much fun! Thanks for the information. One thing I will add say is that we stopped in Nakai for a night and I am so glad we did. It’s beautiful and gives you a really great perspective into rural Laos. We stayed at the Nakai Resort and it was a great option. 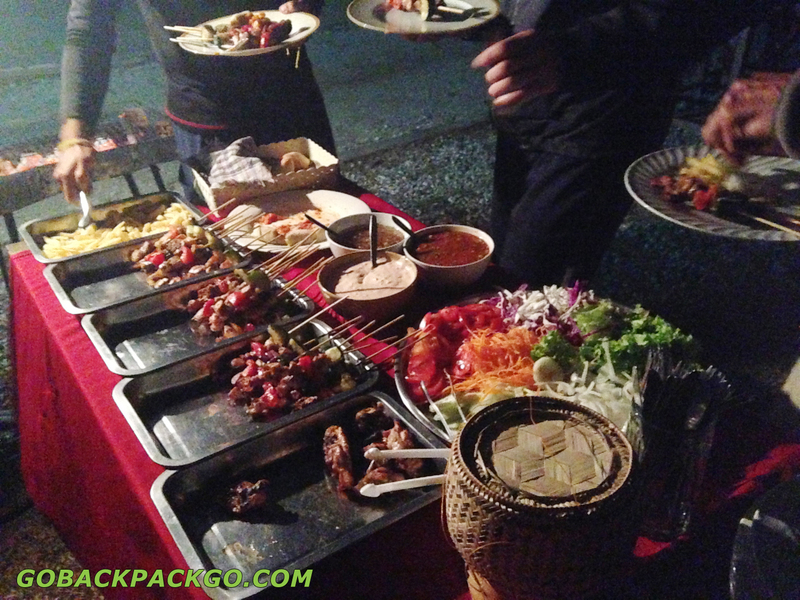 They run a BBQ every night with all you can eat food. Rooms are pretty cheap starting at 40,000 kip for dorm (we stayed in a really sizable double with hot water for 80,000 kip) and the staff is so friendly. We stayed up around the bonfire chatting with the owner of the resort about Buddhism and the Lao lifestyle. I would highly recommend and invite Bounlisth for a beer – he has great stories! I don’t know exactly, probably they went up a little bit as this article is from 3 years ago. To cross the border you have to go y checkpoints, see what is the closest. 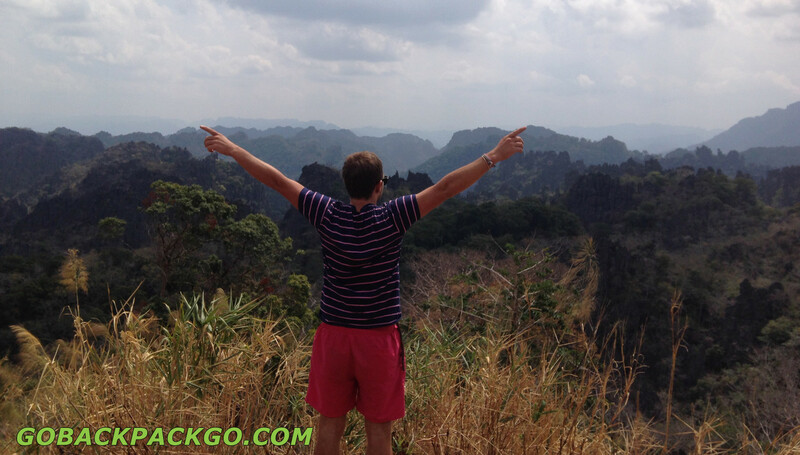 (and make sure you’ve a visa for Vietnam) Have fun on the Thakhek Motorbike loop! 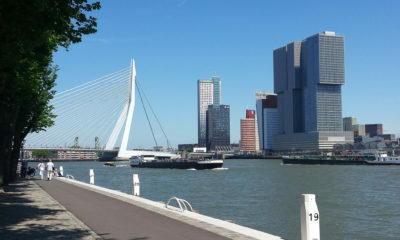 Ik zou graag de loop doen maar zijn er ook wat grotere brommers / scooters waar je met z’n 2-en op kan? Dit imdat mijn vriendin het absoluut niet ziet zitten om op een brommer te rijden omdat ze daar geen ervaring mee heeft. Ik hoor graag van je. Er zijn zeker ook grotere brommers / motoren te huur in Thakhek. Daar pas je makkelijk met z’n tweeen op. Have fun on your motorbike trip! 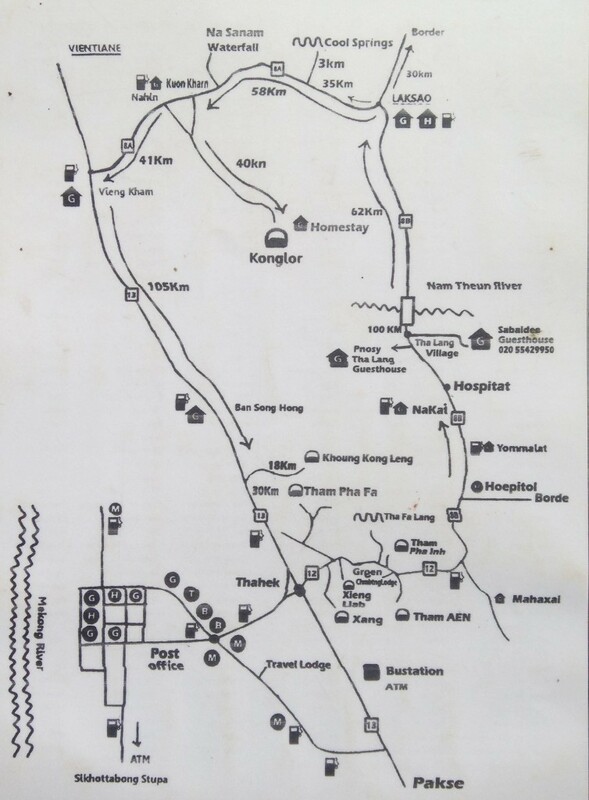 What do you recommend.. the pakse loop or the thakhek loop? Wij denken erover om in januari naar Laos te gaan. Het probleem is echter dat wij geen backpackers zijn maar ‘gewone’ reizigers, die nogal op comfort gesteld zijn. Het is niet zo dat we ganse dagen aan een zwembad willen liggen want dan kunnen we evengoed all in naar Turkije 🙂 We willen dus wel iets zien van het land maar ‘s avonds toch de luxe van een hotel hebben ipv een guesthouse zonder enig comfort. Nu is mijn vraag: is het mogelijk dat we tijdens de loop in een hotelletje overnachten (dat moeten geen 5 sterren zijn ) of zijn er op de rit enkel guesthouses en hostels te vinden. Indien er alleen guesthouses zijn heeft u er dan enig idee van welke toch een beetje comfortabel zijn? In Thailand hebben we verschillende eilanden en steden per scooter gedaan en ook steeds in hotels overnacht maar nu weet ik niet of die mogelijk er ook in Laos is. Als je op Booking kijkt krijg je een beetje een overzicht van prijzen en accomodatie. Hey Paul! I’m really interested in the motorike loop, but I was wondering about the bags, since me and a friend will be backpacking, we will have big backpacks which are hard to carry on the motobike. Did you also have that problem? Do you know any safe place to leave our bags for the three days we’ll be away for? Thanks! Hi! I’m going to Laos on October and I would love to do the trekking. However, I never drove a motorcycle before. Is it easy for beginners? Do you know that there are night buses from Vang Vieng x Thakhek and Thakhek x Vientiene? Thanks!!! Hi Raysa, for every person it is different. But the motorcycles you can rent have different options. Manual motorbike, Semi-automatic motorbike and automatic motorbike. If you’re a beginner try the automatic motorbike. That is just gas and brake. I’m not sure if there are night busses that direction, I travelled the other way 🙂 Laos is awesome, have fun! Hey! Just finished the loop today! The first day we went to the Budda Cave, which was pretty small and you have to pay for parking and entrance. Also you have to cover your shoulders and knees, because it’s like a temple. We also went to the Aen Cave, which costs 20000 kip. It was similar to the one in Halong bay with trashy colourful lights. The way in the motorbike was actually the most impressive thing. Beautiful mountain scenery and landscapes of lakes. The hostel Sabaidee was so friendly with an delicious barbecue and very relaxing garden and socialising games. Perfect atmosphere! 29000 kip for dorm. The second day contains a longer path of sandy road, which is under construction. We skipped the cold springs, but heard it’s really nice. We went to the waterfall, but you also have to pay for entrance and parking. You can drive 2km on dirt road to get to the parking. But you still have to walk about 45min through the jungle to get to the waterfall. 2nd night we stayed at the guesthouse on the map. It’s renovated lately and the people are lovely! 50000kip per bungalow. Last day we went to the Konglor cave. It was an experience on the boat in the darkness. The provided flip flops were uncomfortable and you gonna get a wet but. I didn’t like it. Overall the road is pretty good and you need less time on the road than they say. Also you can spent just 70-80000 kip for petrol in total. It’s really worth it if you like riding a motorbike! The landscape is amazing! Cool extra information about the Thakhek loop Jenny!